This article talks about a free website where you can track the public transport in many popular cities throughout the world. Traze is a free service that shows you the real-time location of public transport. Currently, it covers most of Europe and United States, along with other popular cities from Canada, Middle East, South-East Asia, and Australia. Traze represents different types of vehicles with different colors so that they can be easily differentiable. It shows you the schedule of each public transport vehicle. If you use public transport for most of your travel, you might find Traze very handy. With Traze, you can see the real-time location of public transport and plan your visit according to that. Traze lets you track the real-time location of public transport vehicles. Each vehicle has a small text box on top of it that shows you the time by which that vehicle is late or ahead of its schedule. It also shows you whether a vehicle has wheelchair accessibility or not. 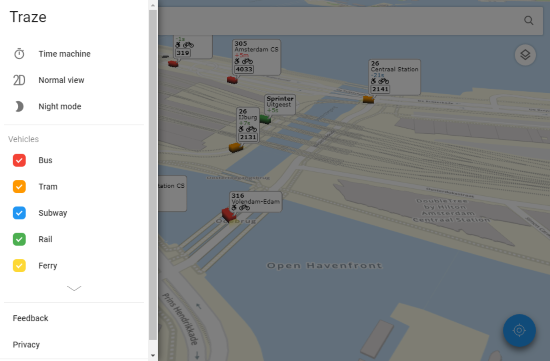 You can click on a vehicle to see its complete schedule along with a list of all its stops and timing. Traze has a “Time Machine” feature with which you can track the position of vehicles for a specific day and time in the past. 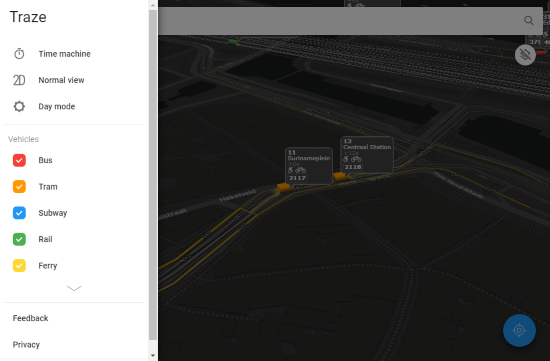 This feature also shows (predicts) the location of vehicles in the near future. Apart from that, you can switch between the Normal View (2D) mode and Perspective View (3D) mode. The Normal View shows you the vehicles from the top (perpendicular to the ground) whereas, the Perspective View gives you a bird-eye view of the vehicles. Traze also has a Night Mode which makes the map dark and adds a headlight in the front of each vehicle. Track the real-time position of public transport here. Traze is a very useful service to track the real-time location of public transport. Using Traze, you can plan your visit, route, and time accordingly so that you will always be on time.